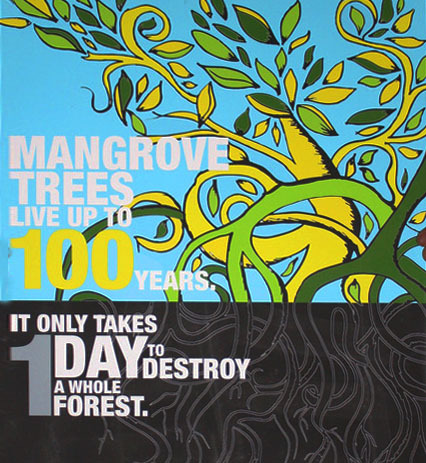 This Mangrove Action Day, Please Help MAP Save the Mangroves! To understand the significance of the 26th of July we need to go back a little in time. It was 1998 when the communities of ancestral users of the mangroves of Ecuador decided to join efforts in a big campaign where the local and national media were invited. They received the support from members of various organizations from Honduras, Guatemala, Colombia, the United States (all of them, at that moment, part of a growing global network opposing shrimp farm expansion) and the members of the worldwide crew of the Greenpeace ship Rainbow Warrior..
On the 26 of July the communities joined in a concerted action to re-establish the mangrove wetlands in an illegal shrimp pond. The action involved members in breaking down the walls of the shrimp pond and replanting mangrove seedlings in the drained pond soil. That same day, the National Coordinator in Defense of the Mangroves in Ecuador was created. A public statement was delivered to the National Authorities at that time, demanding a stop to the mangrove destruction and promoting the concession of the mangroves to the organized grassroots communities of the mangroves. To feed the consumer demand for shrimp in the US, EU and Japan mangrove forests have been cut, people have been driven away from their land, and soil and water have been polluted for more than thirty years in tropical countries. Industrial shrimp farming has caused about 35 percent of the worldwide loss of mangroves. 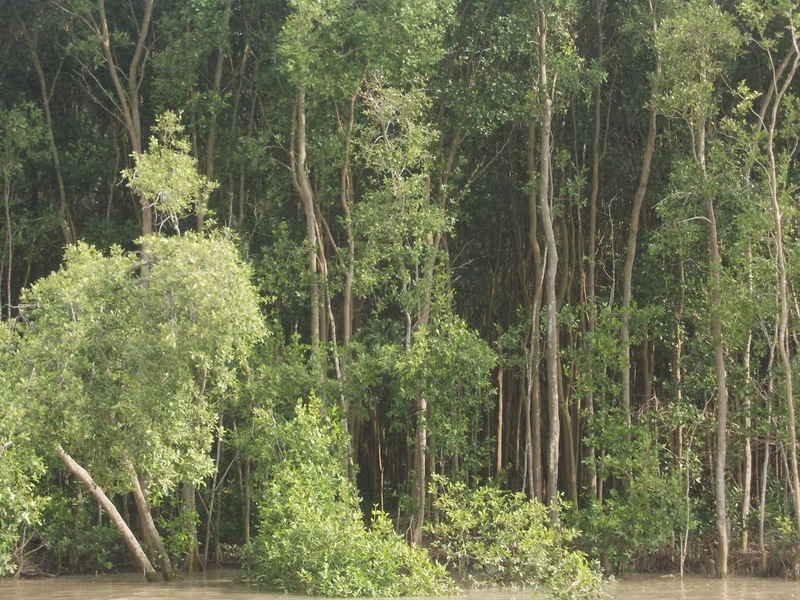 Mangrove forests are a crucial ecosystem - the breeding place for wild fisheries, tremendous carbon sinks and vital habitat for scores of animals. Mangroves also offer the coastal communities food, medicines and protection against hurricanes and tsunamis. Since 1998 the 26th of July has been called the "International Day of Mangroves" or “Mangrove Action Day,” commemorating the Greenpeace activist Hayhow Daniel Nanoto, who died of a heart attack while involved in a massive protest action in Ecuador led by the environmental organizations FUNDECOl (Ecuador) and the crew from the Greenpeace flagship Rainbow Warrior. 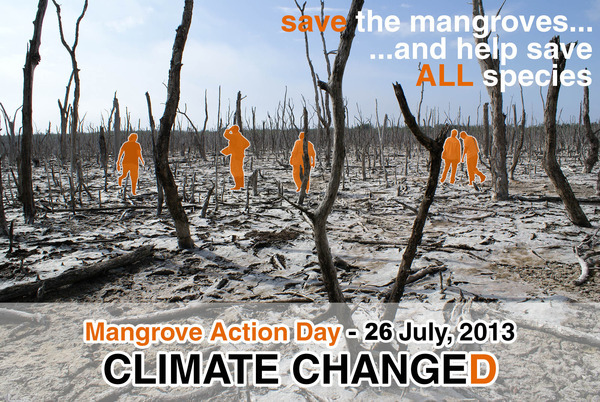 We at Mangrove Action Project again join forces with our friends around the world to celebrate another International Mangrove Action Day on July 26th. We wish to invite all reading this message to please join us in this Day of Action and Solidarity with the global struggle to Save the Mangroves! It is only through our ongoing, cooperative actions will we succeed! And for those who may be so inspired by MAP’s dedicated efforts to conserve and restore our planet’s “Roots of the Sea,” please consider taking this opportunity to support MAP’s important work by donating to MAP today! This would be a most welcome and helpful way to celebrate Mangrove Action Day! Please visit MAP’s website at www.mangroveactionproject.org to mail in or send your contribution via PayPal or Network For Good. This Mangrove Action Day, please step forward with MAP to help reverse the loss of mangrove forests and protect the rights of coastal communities to sustainably manage and conserve their coastal wetlands and the myriad of life sustained by the mangroves. Help us at MAP counter climate change and species extinction. Help us restore the habitat of our oceans’ marine life, the last hunting grounds of the Bengal tiger and the refuge for countless migratory birds, mammals and insects. Please be generous today for the life of our mother planet, for all of our future and the future of our children’s children! PLEASE DONATE TO MAP TODAY! Purchase our beautiful 2013 calendar created by children from all over the world! Editor’s Note: We’ve known for years that commercial shrimp farming is bad for mangroves. It is becoming abundantly clear that it is also bad for the shrimp, as the following stories highlight. On the way of our proactive involvement with Mangrove Action Project (MAP), Humanitywatch and AOSED is going to organize Mangrove Action Day 2013 on 26th July 2013, Friday in Khulna, Bangladesh. We have already started a discussion and going to organize a meeting today (16 July 2013) afternoon at AOSED Training Room with different organizations including BELA, CDP, IRV, Nabolok, Paribartan, Prodipan, Rupantar, Shushilan and others who are interested to join us. Shamim Arfeen from AOSED and I from Humanitywatch is coordinating the program. We will finalize the design of programs and contributions of different organizations to observe the day. Hope Martin can join us on the day. My name is Carlos Zavalaga and I am the director of Proyecto Fragatas in the mangroves of Tumbes-Peru. We are organizing different activities for the local community for the Dia Internacional del manglar on July 26th and would like to share of all this with different international institutions involved in the protection of the mangroves worldwide. We have a blog you can visit: avesfragatasperu.com where you can find information about the Project and our activities. We also have a live streaming platform where people everywhere around the world can watch the activities of the magnificent frigatebirds, a representative species of the mangrove of Tumbes. We will be very happy if you can spread the Word about our Project, blog and live streaming. Many schools watch us everyday. In ocassions (we have a cchedule posted in the blog), we explain our work in from of the camera when working in the mangroves (measuring of frigatebird chicks, capture of adults, description of the birds, etc), all with an educational purpose. By request we can give an explanation in English or Spanish. I hope you find our Project interesting. Our main goal is to make the local community aware of the importance of the mangrove through the frigatebirds. Also we collect scientific information of the frigatebirds to transfer this info to the tourist guides and general people. Volunteers needed in Environmental Protection and Development. Please read below, and pass this on to anyone you think may be interested. Description: The GEPADG is a non profit NGO based in Gunjur in Gambia who have many years of experience in working with international volunteers. 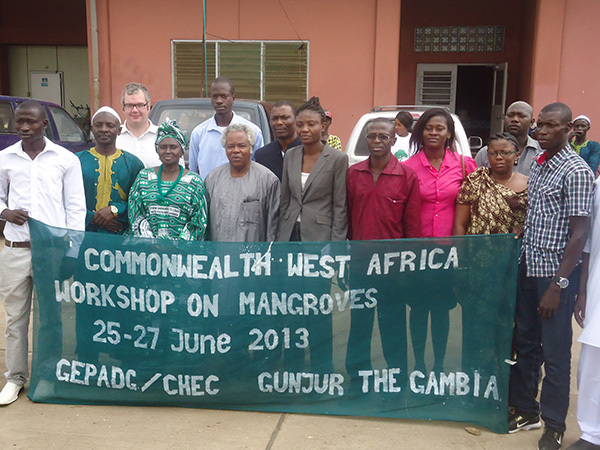 They work to achieve long-term, sustainable solutions to poverty in The Gambia through reversing the current destruction of forests, mangroves and coastal ecosystems. They are always working on different projects and volunteers can choose which area they are most interested in. Areas include: turtle monitoring; tree planting exercises; mangrove regeneration; environmental health and sanitation; village general cleansing; beach sweeping; workshops/conferences; beekeeping; vegetable gardening; community forestry scheme; bird watching and bush walk/patrolling, Eco tourism activities and tourist guided tours within the nature reserve this normally happens between October and November each year and tree planting exercises is between June and August . Turtle monitoring is between June and November each year . The Consumers Association of Penang (CAP) and Sahabat Alam Malaysia (SAM) urge the state government of Penang to cancel the proposed implementation of an aquaculture project in Penaga, Seberang Perai Utara (SPU) because of its potential impacts to the environment and local livelihoods. The aquaculture project would destroy mangrove forests, pollute the sea, threaten fisheries resources and livelihood of coastal fishers, besides exposing the people and paddy fields here to the threat of storms, effects of tsunami and saltwater intrusion. The shrimp farming project to be undertaken by the Aquaculture Operators Association of Penang (Persatuan Pengusaha Akuakultur Pulau Pinang - PENKUA) would cover an area of 204 hectares including mangrove forest from Kuala Bekah River in the south to Kuala Muda River in the north. We understand that the proposed project’s Environmental Impact Assessment (EIA) is yet to be approved. We believe that if this project is given the go ahead, there would be detrimental effects on the environment and the lives of people in the area. Our survey found that many people in the surrounding area do not know about this proposed project. Many among them especially the fishing community are concerned about the problems that would occur if the project is implemented. It is estimated that the livelihood of about 1,000 coastal fishermen in the surrounding area would be affected if the mangrove trees are felled and the sea on which they depend for their livelihood is threatened by pollution from shrimp pond effluent. Fish, shrimp, crabs, clams and molluscs that are a source of income for the fishers will disappear if the mangrove forests are destroyed for the development of aquaculture ponds. At the same time thousands of villagers living near the coast would be exposed to the threat of storms, tsunamis and coastal erosion in the future. And hundreds of hectares of paddy fields and agricultural land could be affected by salt water (sea water) intrusion when the mangrove forest which reduces wave energy and functions as windbreaker is destroyed. The implementation of large-scale aquaculture projects in the state is not a solution to the present shortage of seafood supply. Rather, the short supply of seafood stems from the environmental damage and destruction of mangroves, as occurred in Balik Pulau and Seberang Perai Selatan (SPS), Nearly 2,000 fishermen in these two areas have suffered 50% decline of catches over the past few years due to development and shrimp farming in their area. Christiano Ronaldo, world famous footballer of Portugal and Real Madrid, was invited as an ambassador of mangroves June 26th, to participate in a mangrove planting event alongside Indonesia's President Susilo Bambang Yudhyono (SBY), and the Indonesian Minister of Forests. The Indonesian Mangrove Management Agency (BPHM) was in charge of the technical aspects of the planting. The head of BPHM, Ir. Murdoko, called Ben Brown of Mangrove Action Project - Indonesia to visit the planting site several days before the event for technical recommendations. The planting site at Tanjung Benoa, had been planted on 4 previous occasions, but had experienced total mortality in all those occasions. BPHM's response this time, was to plant mangroves protected by cylinders made of woven bamboo mats, ostensibly to keep snails (considered pests) off the trees and to keep the leaves above the highest tide, to avoid leaves getting muddy. MAP-Indonesia explained that a healthy mangrove plant, of an appropriate species, planted in the appropriate place, will not succumb to pests (snails, etc.) or a bit of mud on the leaves. The key is planting at an appropriate substrate elevation, somewhere between Mean Sea Level and High Tide. BPHM had prepared 4 species of seedlings for planting, Sonneratia alba, Avicennia marina, Rhizophora apiculata and Brugueria gymnorhizza. All four of these species are naturally present at this location. This location already has a healthy growth of mangroves, and was more or less considered for ceremonial planting due to ease of access. It was clear, at the site, that planting too far out to sea would again kill the mangroves. But nature provided a cue as to how far out to sea young mangroves would survive. A lone Sonneratia alba sapling was growing beyond the edge of the natural forest, on a substrate which had experienced sedimentation due to the construction of a sandy beach and hotel next door. This sapling was situated 1.2 m above Lowest Atmospheric Tide (0 meters), and thus MAP-Indonesia reccommended that no plantings should take place below 1.2 meters. BPHM followed this advice by and large, having students plant the area the day before the Ronaldo/SBY event, with 3000 mangroves of mixed species, all of which were planted at 1.2 m or higher. Perhaps the trees didn't need to be planted at 1 meter spacings, and infilling of the naturally occuring forest wasn't necessary, but the event raised an amazing amount of general awareness about mangroves. President SBY and Ronaldo himself planted their mangroves inside of screened bamboo cylinders, adjacent to a dock for ease of access, with artificially heightened sediment inside, because the ceremony took place at a 2.4 meter tide. These larger saplings which were planted ceremonially will be relocated to an appropriate substrate height. So - congratulations Indonesia for raising awareness about mangroves. And congratulations again, for following up the planting today with support of a major Ecological Mangrove Restoration effort in the Province of Gorontalo, which should see at least 2600 of mangroves restored in aquaculture ponds illegally constructed in the Tanjung Panjang Nature Reserve two decades ago. Editor’s Note: MAP has an ongoing involvement and interest in the conservation and restoration issues of Jiquilisco Bay, having recently organized and implemented a very successful workshop on Community -Based Ecological Mangrove Restoration (EMR), which was led by MAP Asia Coordinator Jim Enright. MAP worked closely with Asociacion Mangle in conducting a three day training workshop in EMR. In fact, our work there resulted in the Minister of Environment, Sr. Rosa Chavez, declaring MAP's CBEMR model as the one to follow in El Salvador's National Environmental Plan for mangrove wetlands conservation and restoration. 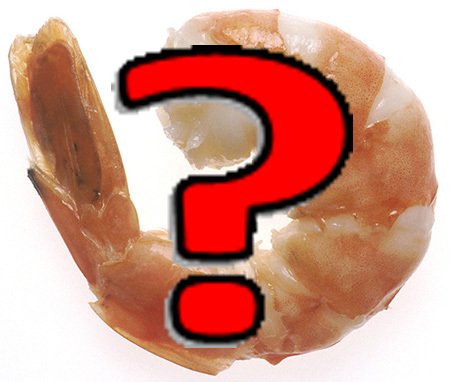 Editor’s Note – MAP congratulates PCC on its bold stance on farmed shrimp. I have been working with several NGOs in Thailand which work on natural resources management, conservation, and policies. However, it was only until recently that I have heard of the Mangrove Action Project or MAP, with an office in Trang my home town, while I was working in Bangkok.